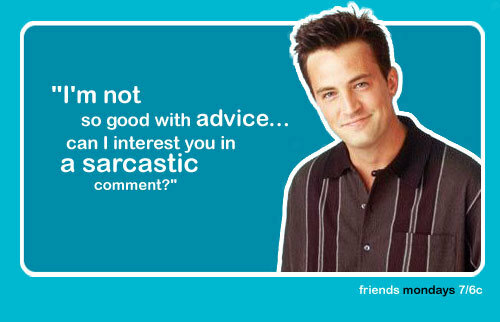 American Wolf: The Top 5 Ready-To-Steal "Friends" Lines. A few months ago, my friend Margaret posted a confession on Facebook: "I stole a joke from 'Friends' & passed it off as my own." It was a perfect miniature commentary on the blurry lines between (post?) modern American humor & culture. To wit: Despite of—no wait, make that because of—its overwhelming mainstream popularity, Friends is the antithesis of a hip show. Contemporary non-hits like Arrested Development are the stuff the hip kids get misty-eyed over; the few big-hit shows that become cool only do so in retrospect, usually through nostalgia (see: The Cosby Show). All of which overlooks a simple fact: Friends is a very funny show. As a result, it exists in a weird pop cultural loophole: It's chockfull of great jokes that thousands of "mainstream" folks have seen, but a disproportionately low number of "hipsters" (Malcolm Gladwell might say "influencers") know. The result is an entire demographic unwittingly hungry for an avalanche of readymade product. But where to begin? Friends lasted 10 seasons is upwards of $300 for the whole series. Well don't worry, American Wolf has got yer back. Some jokes are more universal than others; for better or for worse, I've parsed through all of the shows to compile a Top 5 shortlist of my fav instantly-ready Friends jokes that can be applied to nearly any occasion. Oh yeah, & the first is the one that Margaret had stolen. 1. Chandler: "Oh, I think this is the episode of Three's Company where there's some kind of misunderstanding." Mark Twain famously wrote that American humor is so deadpan that when an American tells a joke, you don't realize it's a joke until after its over. In this regard, Chandler falls somewhere between a punchier Jack Benny & a less-surreal Mitch Hedberg as a master of deadpan. This is one of his finest—& easiest to lift—jokes, because its utility is staggering. When I first read Margaret's post, this was the first joke I thought of, in part because I had stolen it myself earlier in the week when discussing The Avengers movie: "My favorite part is when the one guy fights the other guy." One friend responded with confusion: "Isn't that like, the whole movie?" Exactly. 2. Phoebe: "Did you ever see An Officer and a Gentleman?" Rachel: "Yeah!" Phoebe: "Well, he's kinda like the guy I went to see that with." After Chandler, Phoebe has the most amount of clutch lines, only the majority of them are not universal. But this one's got the perfect setup of a commonplace expectation that delivers an odd punch you don't see coming, as well as a transferability that makes it easy to use, in places far beyond love. Example: Someone describes a brave friend. You: "I know what you mean. Did you see Saving Private Ryan? He's kind of like the guy I went to see that with." & in one instant, the familiar becomes the random, & the pertinent becomes useless. 3. Julie: "We've gotta get some sleep." Ross: "Yeah, it's really 6:00 tomorrow night our time." Chandler: "Well, listen, don't tell us what's gonna happen though, 'cause I like to be surprised." This is probably my very favorite line—it's not nearly as universal as the rest, but when you can work it in (usually when people are describing jet-lag), you'll sound like the cleverest guy in the room. You can also scale it down to a more-universal-yet-less-brilliant-remark with anything that has an obvious conclusion. Example: I recently posted on Twitter, "I can't wait to see the new Lincoln movie, I just hope nobody gives away the ending before I do." Wah-wah. 4. Chandler: "You're right, I have no excuses! I was totally over the line." Joey: "Over the line? You — you're — you're so far past the line, that you — you can't even see the line! The line is a dot to you!" This is my least favorite of the 5, but still included it to reach 5 (damn you, human fingers! ), because I still do use it a lot. I often drop the last part about the line being a dot & stick with the more conventional surrealism of placing a cliched metaphor as the center of a conversation, only to arbitrarily abandon it to make a point. Example: "I am so over you, I can't even see you from where I am." Again, not exactly genius, but a decent thing to say if you wanna throw an unexpected twist into what may otherwise be a blank tirade. 5. Monica: "Hypothetically, why don't I have a baby by the time I'm 40?" Chandler: "Oh dear God — this parachute is a backpack!" & when all else fails, you have this. This is from the early episode where Ross's son is born, & Chandler offers to have a baby with Monica if she doesn't have one by the time she's 40. This, of course, leads to the above dialogue, topped by Chandler falling backwards out of his chair as he grasps furiously at his invisible backpack. So the next time you irrevocably put your foot in your mouth (ideally while sitting down), you know what to do.